Dogs and cats make wonderful companions. A lot of emotion is involved in choosing a pet, but don’t fall into the trap of making an impulse decision. It pays to spend a little time researching what sort of pet suits your lifestyle. That may sound funny, but this a recipe for a happy human-animal relationship. Child Safety – Those with young families or visiting children must recognise that animals and children can both be unpredictable. It is important to select breeds of dogs which are less likely to be aggressive or cause serious damage if the unthinkable happens. Home Environment – Your current or future living arrangements influence what pets are suitable for you. Small backyards are not suitable for some breeds which require room to exercise. Even if they can be walked every day, active breeds will not cope in small yards. Adequate fencing must be provided and for their safety to prevent roaming, being hit by cars and attacks from other animals. If your living arrangements are likely to change in the future, then you may have to consider whether this will be suitable for the pet that you want to get now. It can be hard to find rentals which allow pets and many body corporates won’t allow pets into multi-dwelling complexes even if you are the owner of the unit. Time constraints – If work or social commitments keep you from home for extended periods then you may need to re-evaluate your desire to have a pet or be willing to compromise. Some breeds will cope better than others if left alone for several hours. Some will require another animal companion, which has to be evaluated separately. You have to ensure that you leave yourself enough time to attend to their feeding, exercise and grooming needs and be able to deal with any health problems that may arise. Some of the most common behaviour issues we see relate to boredom and separation anxiety. Financial commitment – Costs associated with feeding, preventative healthcare, vet bills and holiday boarding need to fit into the family budget. The RSPCA estimates that basic pet care costs at least $500.00 per year. This can be much higher for larger dogs and pets with chronic health conditions. 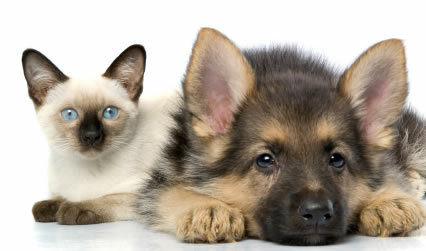 Pet insurance is readily available to deal with unexpected health problems. Spend some time evaluating these before you purchase a policy or get a pet. Cheaper policies may have exclusion criteria and claim limits. Some breeds are not covered for common conditions. There are many places to look when you are trying to find a new puppy or kitten. Local classifieds, pet shops, casual breeders, registered breeders and the RSPCA are the most common places to look. All these animals deserve a loving home regardless of where they come from, but be mindful of what you are paying for. People selling pets privately or casual breeders are not required to adhere to the code of ethics set by the Australian National Kennel Council (ANKC) or the Council of Federated Cat Clubs of Queensland Inc (CFCCQ) or equivalent state authority. These code of ethics ensure breeders are breeding primarily to improve the characteristics of the breed and take action to reduce the incidence of hereditary diseases and not breeding for commercial purposes. They are also required to adhere to animal welfare guidelines, ensuring breeding dogs are not bred excessively. The breeder’s responsibility for animal welfare naturally extends to the puppies and kittens, ensuring they are not weaned too early, that new owners are suitable candidates and that they are provided with relevant information for responsible pet ownership. Puppies and kittens from registered breeders will have started their vaccination course and be wormed, some may even be microchipped. Breeders will provide you with vaccination certificates and registration papers. Being a registered breeder can be a full time occupation with many overheads. Anyone trying to sell pets privately without registration papers at similar prices to purebred dogs or cats needs to be approached cautiously. The following websites may be useful if you are looking for breeders or information about different breeds. Puppies and kittens from pet stores will also have started their vaccination course and be wormed. Many these days will also be microchipped. They will often state that they have been vet checked. This is usually the case when they have been vaccinated, however it is not common practice to provide a written health record and this may not be provided. Pet stores will usually provide a health guarantee. This may only be for about a week after purchase and will usually only cover the cost of a consultation with the vet who is affiliated with the pet store. Any further costs will be covered at the discretion of the pet store or you will be offered a refund. When you adopt from the RSPCA you are supporting a worthwhile animal charity and also helping to reduce the number of unwanted animals in our community. Wherever you choose to look for a puppy or kitten, make sure they are alert and active. Their gums need to be a nice pink colour, their eyes need to be clear and not discharging any mucus or pus, feel for any swelling around their belly button which may suggest a hernia, a big distended belly can be a sign of worms. Compare them with the rest of the litter. If they are small or less active, they may have underlying health problems. Make sure they have started their vaccination protocol and have been wormed. You should always ask for vaccination certificates. Remember that both puppies and kittens require three vaccinations between six and sixteen weeks of age and regular worming. We always give you pet a physical examination when they come in for a vaccination and we can discuss all other preventative health issues with you at the same time.